By Erik Kolsrud in Nogales, Ariz. Many vendors at farmer’s markets sell as a hobby, perhaps as a way to make a little extra money from their gardens or crafts. Not Maria Elena Mendel. Necessity drives her to set up her stand of soaps and jewelry at the Nogales Mercado Farmer’s Market. Having survived three years, Nogales’ open air market has had a rough time taking off. Given that the area surrounding the City of Nogales, Ariz., is considered a “food desert” by the U.S. States Department of Agriculture, one might assume that this would be an ideal place to bring in and sell local produce and handmade goods, but that hasn’t been the case. The USDA defines a food desert as a place where access to fresh fruits and vegetables and whole foods is scarce. There are several obstacles that stand in the way of growing the Nogales Mercado. There’s the weigh station effect. Billions of pounds of produce come through Nogales from Mexico, but the produce doesn’t stay here. The Nogales port of entry is one of the busiest in terms of produce entering the United States. According to the Fresh Produce Association of the Americas, between 2015-2016, 6.3 billion pounds of produce came through the port, but it was shipped off to other parts of the country. Produce that didn’t transport well is often donated to Nogales food banks, where it is then distributed to members of the community. In other words, why should someone buy at a farmer’s market, when they can get produce for free? Still vendors congregate in a parking lot next to the train tracks at Morley Avenue and Court Street, setting up tents and selling their wares from 3 p.m. to 6 p.m., every Friday, but Darling said that’s a little late in the day for many residents. There are private bus lines that takes people from both sides of the border to local grocery stores such as Walmart and Food City, but the buses don’t stop at the farmer’s market. For Mercado organizer Santos Yescas, the market is more than a place to buy local produce and crafts. He sees the venture as a way to build and develop the community. Elsewhere, farmer’s markets have been the crest of an organic wave that has swept the nation. According to the USDA, there has been a 33% increase in the number of U.S. farmer’s markets since 2000. The Department of Agriculture attributes this increase to the interest in eating local, interacting with growers, and buying products free from the perceived danger of GMOs. This is evident in cities as large as Tucson, and in communities as small as Tubac. But not in Nogales. In the meantime, Mendel remains undaunted as she returns to the market every Friday, hoping to do more than break even. 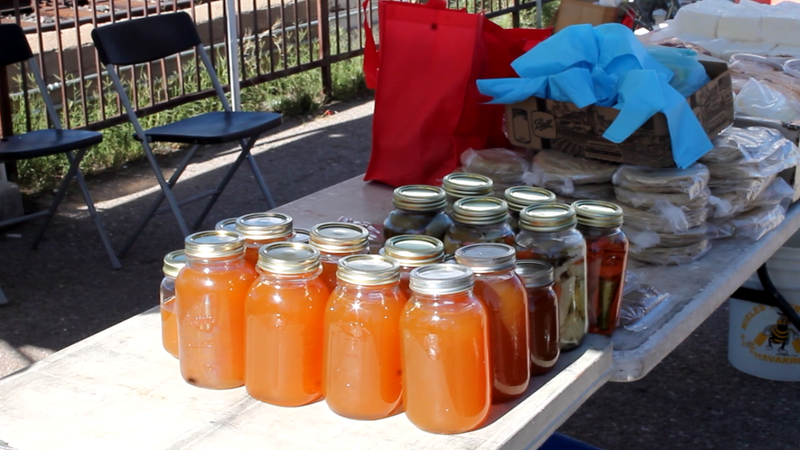 The Nogales Mercado Farmer’s Market meets every Friday afternoon, 3 PM – 6 PM. Watch the audio slide show below to learn more about gardening in Nogales.